That’s it. Kingdom ministry can and should involve a lot more activities after these things are done well and the work is mature but to launch a healthy, self-sustaining, reproducible work you only need to do these three things. 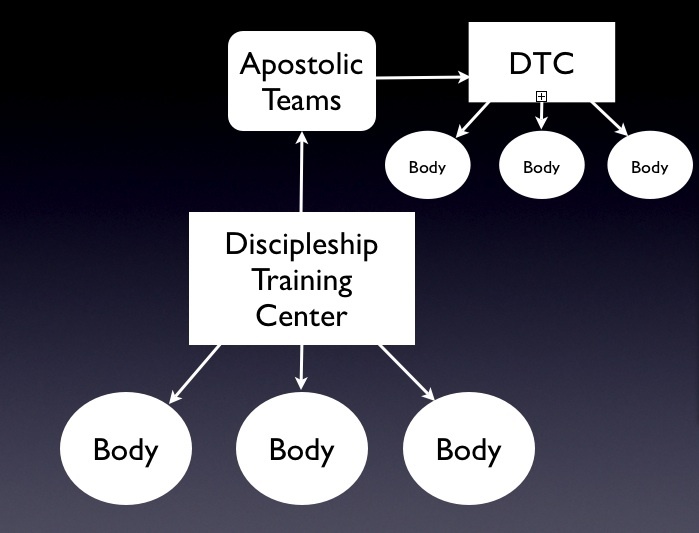 So if you look at this picture – the first thing we develop is the Discipleship Training Center. Trained disciples form and deepen healthy bodies and as body members are continuously trained and living in community we release those with a special 5-fold calling on their life (from Eph. 4 Apostles, Prophets, Evangelists, Pastors and Teachers) to start and strengthen other works. So I’ve been teaching my kids this because, if my 4-year old can understand it, it passes the simplicity test. And you can see why each part is essential. A body (house church) without a clear discipleship training process both lacks a front door and a way to deepen and unify our one faith. A body and training center without releasing the 5-fold has no way to properly steward the unique calling given to the 5-fold. If someone with a 5-fold gift is not released the body will be so imbalanced by that gift it will build itself around one man’s gifts and personality (picture Mark Driscoll only using his full gifting in a house church for 10 years and you get the idea). For the first time in my life I feel I know both WHAT to do about the church and HOW to do it. I’m super encouraged! How have we missed this? Ever since Constantine declared Christianity the official religion of the Roman Empire and began to use the techniques of Roman paganism (temples, priests, pagan holidays etc.) to institutionalize Christianity most people have completely ignored the methods of the first churches or the way Paul went about church planting. Recent movements have begun to try and recapture this ancient way of doing church, believing the Constaninian transition was not an improvement, but that it was ultimately destructive to church life and practice. Many involved in church restoration see Paul’s methods as extremely simple and essentially free of structure; just encourage people to meet in homes, release gifts and live life in community. Each of these elements have been very helpful but they’ve neglected a necessary piece of Paul’s strategy which has thus far, rendered much of the house church / simple church practices virtually ineffective. I call this missing element the Tyrannus Effect. It describes the impact of Paul’s primary church planting activity. How do you begin to plant a church? What do you actually do week in and week out from month to month, year to year? From what I’ve seen, if you don’t believe it involves the planting of a weekly worship service you believe it primary involves weekly meetings in homes. Neither was Paul’s primary activity. In a little known passage in Acts 19 we get the clearest glimpse of what Paul spent his days doing when he wanted to plant churches in a city. 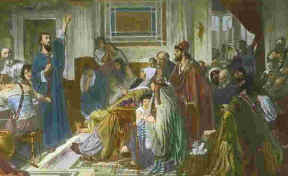 Luke records that after Paul abandoned his original method of working through the local Synagogue he rented space in the School of Tyrannus and held daily discussions there for about a two year period. This is most likely what he was doing in Synagogues before this time and we know this was what he did during his house arrest in Rome (Acts 28). 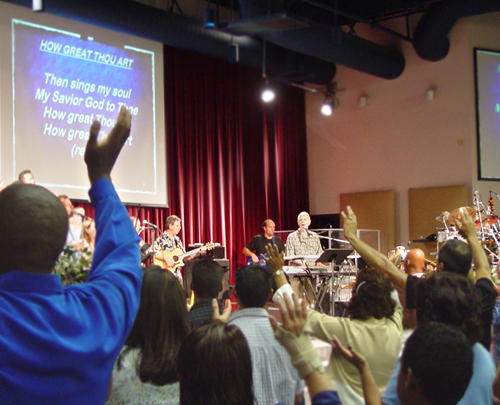 This discipleship center was the public and constant activity and he supplemented this by also training in individual house church meetings (Acts 20:20). What this strategy results in is the Tyrannus Effect. Discussion-based training replaces sermonizing as a means to a long-lasting, faith-building group discovery experience. For the past year we’ve been experimenting with the Tyrannus strategy and have experienced the beginnings of this effect first hand. I can’t imagine what would happen tomorrow if the biblical teachers and trainers in a city came together to disciple the city. This unifying of willing disciplers is the next phase in our strategy to bring our activity in line with Paul’s method. What should you do if you want to experience the Tyrannus Effect in your city? Encourage discipled believers use their gifts to build up their church bodies. Recognize city elders who can help shepherd churches (this will apply mostly to home-based churches). There are many unique challenges to doing this in areas that are very churched with many dis-unified denominations (this may be why Paul preferred to go to areas that were unreached). But we desperately need to create a way for the church to return to our central mission and the final command of Lord – “to go and make disciples of all nations” one city at a time. I posted some questions about the church on a forum I frequent and received some enlightening responses I’d like to share (with their permission). Below is perhaps the most thorough and thoughtful description of a church service I’ve ever read from the perspective a new comer. WARNING: His language is real and raw and we hereby deny any liability for flashbacks or offenses that may result. It’s important to see things from a variety of perspectives and as these churches almost always give new comers feedback cards that come back with canned responses, here’s what you won’t get in your survey. 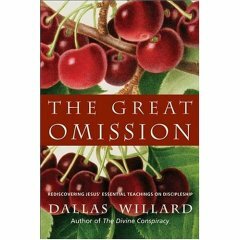 “My biggest issue with church is the suffocating emotionality of it all. First, I pull into the parking lot and make my way past the hip, extroverted greeters who high five the youngsters and give me the over-friendly welcomes. Then I make my way through the halls of people milling about and chattering. This part isn’t so bad except that I get the distinct feeling that everyone is “being Christian” at this point. All the body language and vernacular seems calculated to reflect their true Christian core. Everyone is suddenly called brother and sister and the amount of caring they show over the most trivial aspects of each others lives is both impressive and disturbing. Frankly, I suspect many of them are just doing what they think a dutiful Christian should do with no actual understanding why they should even care. After that, I sit in the pew and consider why I’m there. Why did I come to Church? What am I seeking? What is going on here. About 5 to 10 minutes later, some lead vocalist person shouts into the mic “Let’s all stand up and praise the Lord!” and the cool-Christian-rock-band tears into an up-tempo worship number. Wow, everyone is having such a GOOD TIME! The vocalist inevitably starts clapping in time to the snare hits while bopping their head and lyrics from the powerpoint slide flash across those nifty projection screens backed with some artsy-fartsy image of a cross or serene lake or the clear blue sky. The music is usually based on a verse from Psalms, but fixed up to show that this church understands rock and roll and is cool with youthful energy. Some people in the congregation squish their eyes shut and extend their arms upwards and palms out while getting real into this praise and worship time. Others, bop and clap along with the beat and others stand next to their spouse seeming very robotic like. After 10 to 15 minutes, someone (usually the worship/music director) segues into a soothing piano piece. Everyone closes their eyes, the lights dim and (s)he starts a prayer in a voice that, frankly, sounds like they’re getting good oral. Very breathy and overwhelmed by the majesty of the Father. The worst part is when they (sometimes) do the “let’s turn around and greet each other this morning” and the pews come to life with hugs, handshakes and more over friendly greetings. At this point, I feel like a turtle that’s having it’s shell ripped off by a bunch of curious, but unruly schoolboys and the actual message hasn’t even been delivered yet. Once we get to that part, I’m fine. But once it’s over we have to back to more flamboyant praise-and-worship. Ugh. It’s just the sheer ritual, robotic, trance-like nature of it all. Very uncomfortable to me. And I don’t dare ask questions or tell people that I’m not a Christian. Or tell them I’m a truth seeker who’s read just as much of the Hindu and Buddhist texts as I have the Bible. They’re not so happy-go-lucky then. I’m taking a first shot at branding and creating a defined scope for a church planting network. DiSC (Discipling in Simple Churches) Network. 1. Theology – Conservative, Reformed, HIGH view of Scriptural authority, open and encouraging in the practice of all of the Spiritual Gifts. 2. Mission – Each church would have an INTENTIONAL discipleship process at its center and see this as their central mission. 3. Structure – Simple – Because of the central mission to disciple and because institutional church structures are inherently flawed at disciple-making, churches in the network would adopt a more simple structure to the local body. Our church is still wrestling through joining Acts 29 but it seems the Mission is not clearly disciple-making and we’re not sure yet if they would even accept let alone support a more simple structure for the local body. Communication – Web Portal & regular networking events (maybe quarterly). Training – This could be annually at first and then more frequently if needed. Assessment – This could be decided down the road a bit as vision and doctrine are crystallized. Am I missing anything? Thoughts? Is the Emerging Church Exhausted? Are we Alone? I’ve been a bit of a bystander watching the emerging church train from a distance. There’s no lack of blogs and recent books to read but as an observer it seems like a river that has split into a hundred directions and almost all the water has evaporated. I’m mostly apathetic but a part of me is somewhat sad. The Emerging Church conversation seemed mostly like a vehicle that was supposed to take us somewhere but a river that leads to dry ground simply means we’re more lost than ever. I have great hope for what God is doing through our little community in Fort Thomas but I feel we’re soooo alone. I once thought the emerging church would join and perhaps prove to be a great companion but that seems not to be. They’re tired and offering little to no direction, no helping hand, no brotherly fellowship. I guess I really want to know, are we really alone?